The SOTA Water Ozonator WOZ5 Product Manual SOTA Instruments Inc. The Water Ozonator is a consumer product designed to be used as part of a Wellness Lifestyle. A commitment to healthy lifestyle choices is an important factor in the journey to Wellness. 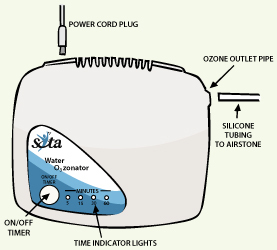 The SOTA Water Ozonator produces freshly ozonated water. The fresh taste and extra oxygen are an energizing way to hydrate your body. The Water Ozonator is designed to be used independently, but can also be used together with any of the SOTA Products. With proper care, your Water Ozonator should provide you many years of trouble-free use. Please read this manual thoroughly before using your Water Ozonator. This is the most up-to-date manual. 1. As with all electrical products do not use near water, when driving a car or when operating heavy equipment. Avoid breathing in the Ozone directly from the airstone as it may irritate lung tissue. Always use in a well-ventilated area, such as under a stove top exhaust fan. Do not operate the unit without the built-in air pump running. If the air pump is not running there will be no bubbles coming from the airstone. GREEN: Indicates the unit is on as well as the timing selected. Connect the silicone tubing to the ozone outlet pipe on the side of the Water Ozonator. Note: To make it easier to connect, dip the end of the silicone tubing in water. The silicone tubing will then slip on easier. Submerge the Airstone, attached to the silicone tubing, in a glass container of water. Use a glass container as glass is ozone resistant. Chilled water holds more ozone but room temperature water is healthier for the stomach. It is important to place the water with submerged airstone in a well-ventilated area, as concentrated ozone in air may irritate lung tissue. For example, under a stove-top fan. Place the container of ozonating water well away from the ozone unit. Note: Ozonating liquids other than water may clog the airstone and will void the warranty. Push the ON/OFF/TIMER button to turn the unit ON. All the lights will flash in sequence to indicate the unit is ready for use. The unit starts with the 5 minute timer cycle. If more than 5 minutes is required, push the ON/OFF/TIMER button—each push moves the timer from 15, to 30, to 60 minutes. A Green flashing light indicates which time is set. See Timing to Saturate with Ozone below for more information. Check to be sure fine bubbles pass out of the Airstone into the water. If you do not see any bubbles, ensure the silicone tubing is firmly attached to the ozone outlet on the side of the unit. As the unit operates, you should catch the smell of ozone. At the end of a timed session, the unit will beep, all the LED lights will flash, and the air pump will continue to operate for an additional 10 seconds to purge the ozone from the tube. The unit will then turn itself OFF. Allow water to drain from the tubing after use. This ensures water will not drain back into the unit. Use the freshly ozonated water immediately for optimal results. If left for 20 minutes in open air, the ozone dissipates out of the water and the benefits of the extra oxygen will no longer be present. To turn the unit OFF at any time, hold the ON/OFF/TIMER button down for a full two seconds. Turn the unit off and unplug the wall adaptor when not in use. Charcoal filter: A charcoal filter inside the unit protects the circuit from the ozone in air. Excess beads of charcoal may fall off the filter and out of the unit. This is normal. Simply discard the beads. Timing: When the timer is set for 15, 30 or 60 minutes, the lights indicate remaining time. For example, when set for 60 minutes, the Green 60 minute LED flashes continuously. As time progresses, the Green 30 minutes LED comes on as well to indicate there is 30 minutes or less remaining. As time progresses, the 15 and then 5 minute LEDs will each come on to indicate the time remaining. Storage: Larger quantities of ozonated water can be stored in a thermos or glass container with an air-tight lid. The amount of ozone in the water will continue to dissipate, eventually leaving no ozone in the water. Pump: If the built-in air pump stops running, turn the unit off and contact your closest repair depot. 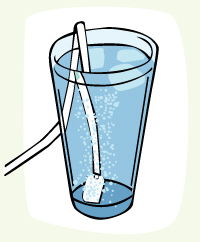 Quantity: It is usually best to gradually increase the intake of ozonated water. To begin, it is suggested to ozonate only one glass of water a day. If well tolerated, increase to two or more glasses of ozonated water daily. Length of use: 16 ounces (500 ml) or more a day for 2 to 3 months. For ongoing use, drink up to 16 ounces (500 ml) a day or as preferred. If using for an extended period, it is wise to take breaks. One cup of cold purified water is saturated with ozone within 2 minutes to over 1,000 mV ORP (Oxidation Reduction Potential). The 5-minute setting is sufficient to ozonate up to 4 cups (1 quart or 1 liter) of purified water for either room temperature or ice water. Set the timer depending on the quantity of water to saturate with ozone. The output of the Water Ozonator is sufficient to sterilize water. It does not remove impurities such as heavy metals - a water filtration system is needed for that. The amount of time required to sterilize water depends on the degree of contamination of the water. The timing in the table above is for saturation only. More time may be required to sterilize water. To operate the ozone generator from a 12 Volt DC source such as an automobile battery, or an appropriate solar panel, purchase a Universal Power Cord with Tip or Center Positive. Greater than 200 mg/Hr O3 @ 1.5 LPM. Measured using an Ozone-in-Air GM Anseros Ozone Analyzer, Model Ozomat GM 6000-RT. Ozone concentration is 3.6 Gamma (mg/l or ug/ml) @ 0.5 LPM. Pump outputs 0.5 PSI pressure, 2 LPM (2000 cc/min) volume. Uses Fused Quartz Glass and High Grade Stainless-Steel ozone chamber. With normal use, the chamber should last several years. The manufacturing of the SOTA Products are a global collaboration. The following countries participate in the making of the Water Ozonator (listed in alphabetical order): Canada, China, Hong Kong, Malaysia, Spain, Taiwan, Thailand and the USA. The Water Ozonator Model WOZ5 is covered by a two (2) year limited warranty. Please keep proof of purchase. Warranty is void if the failure is due to abuse, negligence or if pure oxygen is used. SOTA reserves the right to make changes to the Water Ozonator without obligation.